Thanks to 120 volunteers on Saturday, March 28th, we reached the goal of of collecting the 10,000th bag of trash in our history! As important, the natural beauty of one-half mile of shoreline was restored. These volunteers removed 300 bags of trash, enough to fill a large dumpster, in just two hours. They also rolled away 150 tires bringing our total to 3,700! The target area was a cove on the east side of the Haw River Arm near the confluence with Robeson Creek. A flotilla of volunteer boaters ferried the trash bags and tires back to the Robeson Creek Boating Access. Crosswinds Boating Center donated use of a pontoon boat.Chatham County Solid Waste & Recycling Division of Environmental Quality provided a dumpster for the trash and hauled it away. A grant from Bridgestone America’s Tires4Ward program will enable recycling of the tires. The diversity of volunteers was inspirational. 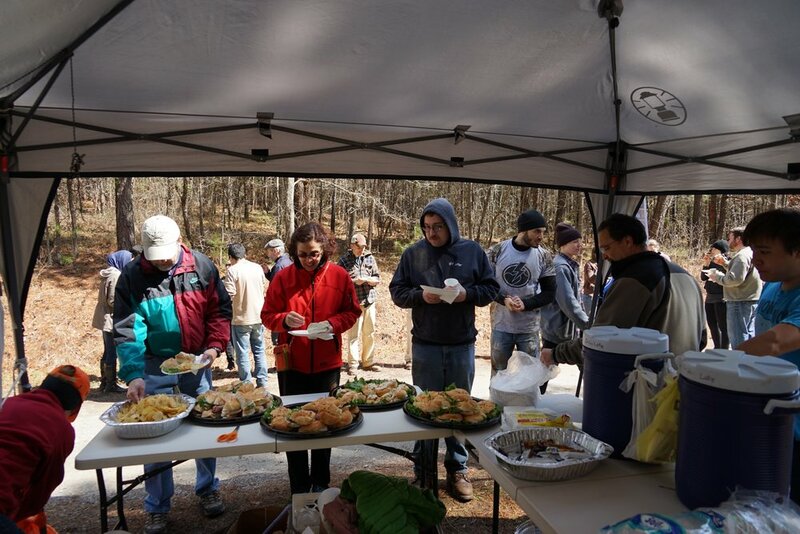 We had students from Carrboro High, Carolina Central Community College, UNC-CH, NCSU, staff from NC DENR, companies such as SOLitude Lake Management and community service organizations such as Activate Good of Durham/Orange Counties and the National Iranian-American Council. We got great TV coverage from TimeWarner News. Everyone enjoyed the celebration lunch, the award of prizes to those lucky enough to find the Trash Treasure Hunt items and the raffle of a dinner at the Pittsboro Road House in recognition of reaching our goal. We've cleaned many of the same areas several times in the last 5 years because every rainfall flushes more trash from all counties in the 1,400 square miles of watershed. Can you imagine the damage to natural habitats and beauty without our volunteers? The only way to solve this problem is to educate citizens about their connectivity to the lake. That's our long-term goal. We plan to invite public interest groups, educators and county staff and elected officials to take a pontoon boat tour of the lake with us. They will see natural vistas uninterrupted by a single house on the shoreline, great blue heron, bald eagles and much more beauty. But they will also see trash. We will urge these participants to help us raise public awareness throughout the 1,700 sq. mi. of watershed.